Wednesday November 19th is World Toilet Day. For readers in the developed world, this conjures up images of gleaming white porcelain and a hole down which bodily waste vanishes swiftly to be dealt with, somewhere, by someone else: a machine, essentially, for removing our bodily wastes swiftly and making them somebody else’s problem. Wherever there are human beings there is bodily waste, mounting inexorably. Modern developed cities of millions depend on infrastructure to remove this quickly to avoid infection and contamination of ground water. For much of the world and for much of human history, however, the process of waste disposal has been much less sterile and impersonal, the toilet simply a hole in the ground that must be emptied manually, or even just a designated area of the countryside to which one retreats in hope of some privacy. Here in London, the Wellcome Library’s home city, about 150 years ago the populace saw the formal opening of a great sewerage system constructed by the Metropolitan Board of Works and its engineer Joseph Bazalgette (1819-1891). 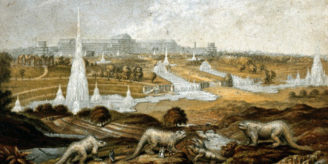 Prior to this, an increasing proportion of London’s sewage was routed into the Thames (via drains set up originally for surface water), leading to dreadful pollution and the Great Stink of 1858, but much still went into cesspits near people’s houses, from which it was periodically removed for disposal. On the Library’s shelves and in the UK Medical Heritage Library are copies of Henry Mayhew’s magnificent survey London Labour and the London Poor, a mid-19th century overview of all the ways the poor scrambled to make a living in a teeming metropolis closer to Calcutta or Manila than to modern London. Mayhew interviews many people who make their living from London’s waste – street-sweepers, collectors of cigar-stubs and waste newspapers, rag and bone men. 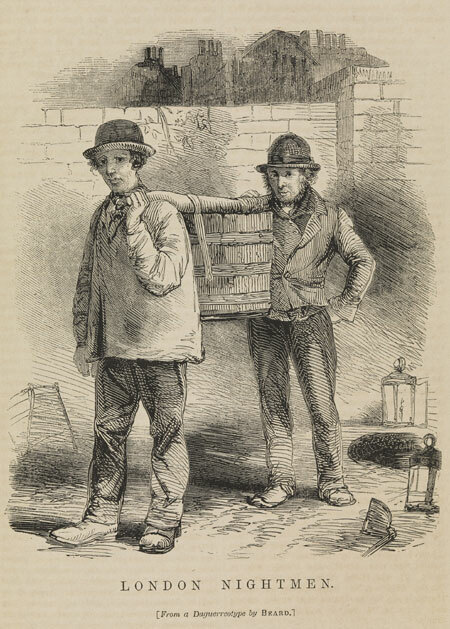 Among these figures are the “night-men”, the labourers who empty cesspits under cover of darkness. They work in teams of four: the first, one suspects the most junior of the gang, climbs into the cesspit and shovels waste into the large bucket lowered to him by the second, whilst the third and fourth carry waste back to the waiting cart. On one occasion I went to see a gang of night-men at work. 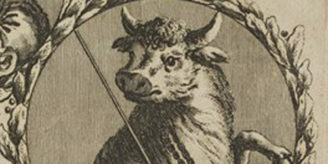 Large horn lanterns (for the night was dark, though at intervals the stars shone brightly) were placed at the edges of the cesspool. Two poles were also temporarily fixed in the ground, to which lanterns were hung, but this is not always the case. The work went rapidly on, with little noise and no confusion. The scene was peculiar enough. The artificial light, shining into the dark filthy-looking cavern or cesspool, threw the adjacent houses into a deep shade. All around was perfectly still, and there was not an incident to interrupt the labour, except that at one time the window of a neighbouring house was thrown up, a night-capped head was protruded, and then down was banged the sash with an impatient curse. … The smell, although the night was frosty, was for some little time, perhaps ten minutes, literally sickening; after that period the chief sensation experienced was a slight headache; the unpleasantness of the odour still continuing, though without any sickening effect. The nightmen, however, pronounced the stench “nothing at all;” and one even declared it was refreshing! The Great Dust-Heap at Battle Bridge, London, where waste was processed. Watercolour painting by E H Dixon, 1837. Wellcome Library no. 38712i. From here, the waste would be taken to a processing site such as the great refuse mounds at Battle Bridge – near the site of Kings Cross station, just down the road from the Wellcome Library. Here it would be put in settling ponds and mixed with other organic waste such as blood from London’s slaughterhouses, and thickened with ash from the city’s many coal fires. After some time to dry out and thicken, it would render down into a thick organic mix ripe to be sold as fertiliser. By contrast, for many years Bazalgette’s beautiful sewer network that replaced this system existed only to carry sewage downriver and dump it into the sea: making it, as we said at the start, someone else’s problem. Dirty and smelly though it undoubtedly was, in some respects the mid-Victorian city was greener than that of a hundred years later: only now are we learning to combine convenience with recycling. As we visit the toilet, several times a day, and enjoy the convenience with which our waste disappears, it’s always salutary to remember it hasn’t dematerialised: someone, somewhere, will be making a living dealing with it. 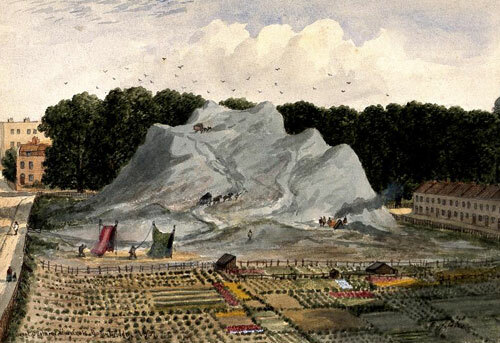 The illustration of the great dust heap at Battle Bridge is a wonderful one — it will be of interest to Dickensians as this site was the inspiration for Mr. Boffin’s great dust-heaps in Our Mutual Friend. It would make great cover artwork for some future edition of that novel.